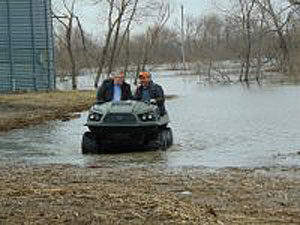 Former Iowa Ag Secretary Bill Northey tours flooded areas. Iowa’s former secretary of agriculture is back in the state to survey flood damage and talk to displaced residents, especially farmers who have had many hundreds of acres underwater. Northey and Iowa Senator Chuck Grassley plan to conduct a town hall meeting at the Mills County Fairgrounds in Hamburg this afternoon at 1:30 p.m. Northey says he worries a wrecked levee system along the Missouri River is leaving the area vulnerable to more flooding, perhaps very soon. He says he knows fields are unprotected, as farmers wait for the water to recede. 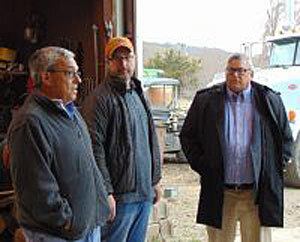 Missouri Farm Bureau President Blake Hurst with farmer Andy Spiegel and U.S.D.A. Undersecretary Bill Northey. more normal situation,” Northey says. “But it could be worse before it gets better as well.” Northey says he’s overwhelmed by the scope of the damage he’s witnessing in the region, noting, flooding is always devastating but he wasn’t prepared for this. “It’s just mind-boggling to see it in person,” Northey says. “How much water there is and how much water has to get off of here to eventually make this land such that they can get out there and get some planting done.” Northey says he has two messages for his boss, U.S. Ag Secretary Sonny Perdue. First, farmers need help to recover — now, and second, changes are needed in how the Missouri River is managed to prevent another repeat.